Skincare. I think you guys all get it now, I just love it! I've always had oily and acne prone skin, and add on some huge pores that are easily clogged, it really is a pain to find products that work. The good news is that my skin isn't overly sensitive so I can try a range of products and not get any crazy side effects such as redness or irritation from constantly swapping things out. My skin is also very clear about whether or not it likes a product which is also nice because within a week or two I will know whether something works for me and it either works amazingly or not at all. This is convenient for me because it makes it very easy to review a range of products, and is also why skincare products are usually what I talk about the most, and I'm lucky enough to get many opportunities from such brands! OZ Naturals is slowly, but surely, becoming one of my favorite brands to work with. I've tried a number of their serums out already so when I was presented with the opportunity to try another one I immediately jumped on it. This particular serum is the OZ Naturals 2.5% Retinol Serum. In general people tend to shy away from Retinol products but I must say don't be afraid of it! When it comes to skincare you can get bad side effects if you misuse just about anything so Retinol is not something to be afraid of. Retinol is most commonly used to reduce the appearance of fine lines and wrinkles but there's also the benefits of improving texture and tone as well as a good ingredient to combat clogged pores and acne too! Our CLINICAL STRENGTH 2.5% Retinol Serum is the highest concentration of retinol available without a prescription. It includes Astaxanthin and Vitamin E, which provide unmatched antioxidant properties and activate collagen and elastin production. CRUELTY FREE and 72% ORGANIC our 2.5% Retinol Serum does not contain alcohol, parabens or sulfates and is safe for all skin types. MADE IN THE USA, OZ Naturals formulates the most effective anti-aging products on the market. 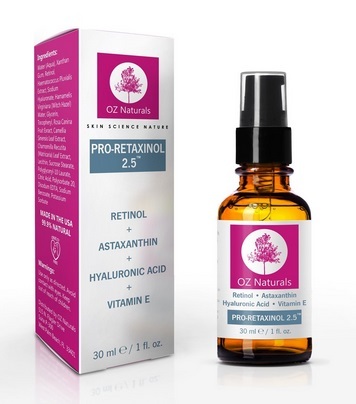 OZ Naturals 2.5% Retinol Serum with ASTAXANTHIN is proven to minimize hyperpigmentation, fine lines, wrinkles and greatly improve texture and tone. Our 2.5% Retinol Serum is an anti-aging powerhouse proven to rejuvenate your skin via a synergistic and unique blend of active ingredients that will leave your skin healthier and with a more radiant and youthful appearance. Co-Founder and Certified Esthetician, Angela Irish launched OZ Naturals as a company that embodies everything she's passionate about -- healthy skin, anti-aging, natural ingredients, and utilizing the latest technology to formulate the highest quality skin care products on the market. Utilizing her personal experience of skin issues, that she understands that when your skin is unhealthy it can negatively affect your self-esteem. After try tons of products over the years she was always left with the same skin issues as before. Sometimes even worse than before. Angela knows how disheartening this can be, especially when so many skin care products make huge claims, and simply do not deliver. It's especially frustrating when the cost of those products are hardly affordable, and you realize once again that you've wasted your money. While it's true that beautiful skin is also hereditary, healthy skin comes from taking care of the inside and outside of our bodies. However, finding the right products for your skin can be the toughest part of the equation. This is why OZ Naturals was founded, to create healthy, premium skin care products to help those who weren't naturally born with perfect skin, to obtain more perfect skin. The kind of skin that everyone deserves to have. First impressions. I noticed that this particular product is housed in a small glass bottle with a pump. The other serums I have used from this brand all came with a dropper top. I must say I've been liking the pump this time around because it's a lot easier to dispense when you're one handed. I especially noticed the pains with a dropper when I got to the dregs of the bottle. When there's only a little bit of product left you would need several passes with the dropper to get out the proper amount and when you're trying to tilt the bottle with one hand, and squeeze the dropper with the other, you're basically left with no free hands to catch the product with. Personally I'm not crazy about using a cotton pad for serum since I find that it really soaks up the product, so using the pump is a much better solution. The product itself is a translucent rose color and it is fairly odorless, if anything it's just a faint herbal scent to it. Two small pumps dispenses the perfect amount of product. This stuff is a cross between a liquid and gel, a little thicker than liquid but still slightly runny. It spreads very nicely into your skin and absorbs fairly quickly. It doesn't leave your skin feeling tacky or sticky nor is there anytime of scent left behind. As for results, I've been using it for about 2 weeks now and I'm noticing an improvement in my skin tone. It is more even and it really has helped fade acne scarring. I don't really have any lines or wrinkles right now so I can't vouch for the effectiveness for that. For a Retinol serum I give it two thumbs up and would recommend it to anyone looking for one!